The efficacy of acupuncture has prompted tremendous research worldwide including the United States. The more common explanations of its course of action are mentioned below. The theory of acupuncture is based on the patterns of Qi (energy) flow through the body. During normal state of health, energy travels smoothly through a network of meridians in the body. Disruption in this normal Qi flow is responsible for occurrence of disease. Acupuncture corrects these imbalances by releasing energy blocks and re-establishing normal Qi circulation, thus stimulating the body’s natural ability to heal itself. Acupuncture therapy can release blocked qi in the body and stimulate function, evoking the body’s natural healing response through various physiological systems. The modern scientific explanation is that needling the acupuncture points stimulates the nervous system to release hormones, endorphins and other chemicals naturally in the muscles, blood stream, spinal cord, and brain. These chemicals can change the experience of pain. They also stimulate the body’s natural healing ability, promoting physical and emotional well-being. 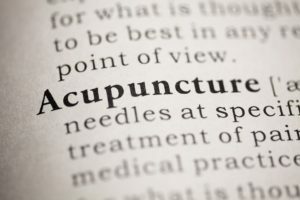 Modern research has demonstrated acupuncture’s effects on the nervous system, endocrine and immune systems, cardiovascular system, and digestive system. By stimulating the body’s various systems, acupuncture can help to resolve a wide range of conditions including (but not limited to) chronic pain, allergies, anxiety, digestive issues, as well as providing sense of well-being. What happens during an acupuncture treatment? First, Dr. Han, our experienced acupuncturist in West Hartford, CT, will ask about your health history. Then, he will feel your pulse, and possibly perform some additional physical examinations depending on your individual health needs. Using these unique assessment tools, Dr. Han will be able to recommend a proper treatment plan to address your particular condition. To begin the acupuncture treatment, you lay comfortably on a treatment table while precise acupoints are stimulated on various areas of your body. Most people feel no or minimal discomfort as the fine needles are gently placed. The needles are usually retained between five and 30 minutes. Most patients find the process very restful and relaxing; many even fall asleep during the treatment. How many treatment will I need? The frequency and number of treatments differ from person to person. Some people experience dramatic relief in the first treatment. For complex or long-standing chronic conditions, one to two treatments per week for several months may be recommended. For acute problems, usually fewer visits are required, usually eight to ten visits in total. An individualized treatment plan that includes the expected number of treatments will be discussed during your initial visit with us. What can I expect before and after a treatment? Acupuncture treatments bring about changes in the body, which continue for a few hours after the treatment. In order to receive optimal results, it is important to avoid physical or mental exertion immediately before and after the treatment. It is important to eat a light snack before the treatment. Also, avoid drinking alcohol immediately after your session for best results. Which conditions do we treat? Is Acupuncture covered by insurance? We are currently an in-network provider for Cigna. For other insurance companies, we can provide you with a proper receipt with billing code if you would like to submit it directly for possible reimbursement. Acupuncture treatments can also be claimed on Flexible Spending Account (FSA) and Health Savings Accounts (HSA). You can give us a call or fill out this form to request for a date and time you would like to come in, and we will contact you within 24 hours.